We are conveniently located on the northwest corner of State Road 32 and Rangeline Road. Our entrance is on Rangeline Road just north of the stoplight. From Interstate 69, take exit 34 at Daleville. Follow signs to State Road 32, and take it west approximately four miles toward Chesterfield and Anderson, past the Anderson Municipal Airport. 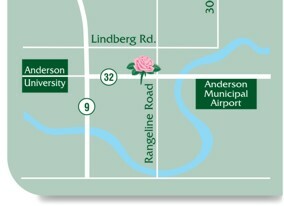 From State Road 9, turn east on Highway 32 near Anderson University, and go approximately one mile. Please call 765-643-7474, if you need further directions. Planning a funeral service often requires a great deal of thought, involving numerous separate decisions. Our trained staff can assist you in choosing the right flowers, music, clothing, and other essentials. about how you wish to honor your loved one and how you want those ideas expressed. Whatever your situation or desire, we're here to help before, during, and after the funeral service. We pay particular attention to the smallest details that can make each service meaningful in a special, personal way. This begins with your convenience: from our sheltered drive-to-our-door entryway, two adult lounges - one is smoke-free, a children's room, visitation rooms that are comfortable and attractive with areas for quiet reflection, one-level design with no stairs to climb, to the lighted parking for 150 vehicles.